This part of the site is dedicated to the early history of NZ Enduros, from the start point in 1974 up to the 1980s. The first decade of NZ Enduros were the years when almost all events were tough and the courses an eight hour all-day slog over a wide area of varied terrain, usually only covered once. Throughout this time the bikes had to be road legal to be able to cover the sections of public road between competitive sections. The growth of Enduro in NZ was almost entirely rider driven, with the major organisers and promoters of the sport being the riders themselves. One of the rules of those first years was that every rider was required to drop a round from the series, and were expected to help organise that event. Many riders contributed to the early success of the sport and in that first decade. People who instantly come to mind include; Dave Judson, Roy Long, Gary Wendt, Kevin Sargent, Bob Jackson, Dave Vinsen, Tjebbe Bruin, Lester Yates, John Isdaile, Phill Thompson, Laurie Pettersen, Alaistair Meikle, John Shand, Russell Hurring Alan Olliver, Barry Reiher and Tim Gibbes. There are more of course, people who spent countless hours finding and arrowing courses and running the rides, I simply can't remember them all now. In NZ there were almost no exotic European Enduro bikes available so Japanese trailbikes were were modified to fill the role. The seventies were also a time of remarkable camaraderie on and off the course and that story will take up more pages. Perhaps most remarkable aspect of the second half of the seventies and into the eighties was the massive development of dirt bike technology. Those technical developements would in turn create the further specialisation of the dirt bike into separate adventure, trail, trials, enduro and motocross streams, where only a decade earlier there was little to separate them all. Enduro has its roots in observed trials, a man verses terrain contest that goes back to the dawn of motorcycling itself prior to WW1. Motocross, or scrambles as it was first called, was a much more recent invention, yet it was motocross that would influence Enduro most from the late seventies. From about that time terrain would become easier while speed in motocross style special tests would become more and more critical in results. It would not be until after the turn of the Millenium that focus would again turn to more difficult terrain in the 'new' Extreme events. NZ had its own market dynamic as well in the early seventies. A hangover of severe import controls meant that genuine competition bikes were in very short supply and the culture of mend and modify still pervaded motorcycle clubs. NZ Enduro bikes were most often stripped down and modified trail bikes, twin shock machines with just 4 inches of rear suspension travel. All these machines would need improvements like gearing changes, better cleated footpegs, after-market shocks, and better tyres. Some riders went even further with engine and exhaust modifications, even entire engine/frame transplants. Trials bikes of the day were also competitive in NZ Enduros, especially when the going got really tough, as they were far lighter than trail bikes. NZ Enduro rules in the seventies were based on the USA New England scoring system, designed to allow the effective splitting up of road and off road terrain into sections without the need for large numbers of checkpoints or special tests. Ability to ride fast in tight difficult terrain was critical, so that riders with good technical trials skills were prominent. 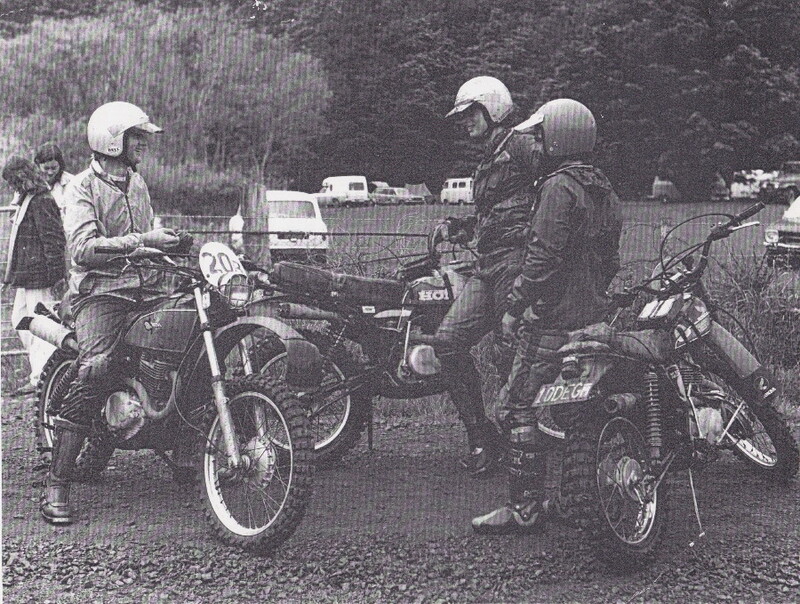 By the late seventies specialist Japanese Enduro bikes had arrived and were available in NZ in good numbers. With the long-travel suspension revolution well underway these bikes were improving vastly every year. But long-travel suspension and more powerful engines, made Enduro bikes (though far faster) harder to ride in tough terrain. By 1980 pressure was being put on NZ Enduro organisers to make easier, faster courses. Rule changes were also introduced to favour faster ISDE-style events, where speed in special stages was vital, rather than the ability to conquer obstacles and climb hills first-time. In addition some riders had become interested in competing in the International Six Day and Australian Four Day Enduros where speed in motocross-style special tests counted more than ability on tough trails. Was it all for the better? Though I competed right into the 1990s, in my mind the tougher, single loop events common in the early days made for more variety, greater camaraderie and ultimately more satisfaction. A rose-tinted view undoubtedly, but the recent rise of Rally and Extreme Enduro perhaps indicates a swing in sentiment at least back to a more heroic style of man verses terrain contest. So the wheel turns. As time allows I will add material starting with the early days and progressing through the years. JN 2013. About the photo above: New Zealand's first National Enduro round was a 2 day event held at Maramarua Forest at Easter 1976 as round 1 of a 6 round Championship. The photo tells a lot about the times and personalities of the coming decade. The three riders on the start line are Kevin Sargent (CZ250) John Nicholson (Yamaha 250 special) and Tjebbe Bruin (Husky 400). The bikes are all have short travel suspension and are modified in some way. Also in the photo (by the pole) are Bob Jackson, Ian Vinsen and other members of the organising AMCC. Riders in the back of the picture include Joe Van Lier, Phillip Thompson and Gary Wendt. Photo contributions: If you have photos of this era that you would like to share please send captioned digital files by email. Files should be . jpg between 800k and 2megs. Dates and details: The material I am putting up on this section of the site comes from my own tatty records and my memory, neither of which are by any means complete, so I would be glad of any help. If you have a better grasp of any exact detail please contact me by email so I can make corrections. Some of the video and images published on this site were not taken by myself; Natalie Kirton, Chris Stephens, Dave Britten, and Geoff Osbourne and many others have all contributed. Thanks folks for helping document so many good times. From time to time uncredited photos may slip into the system. If they have please let me know and I will correct the credit, or remove them as you wish.